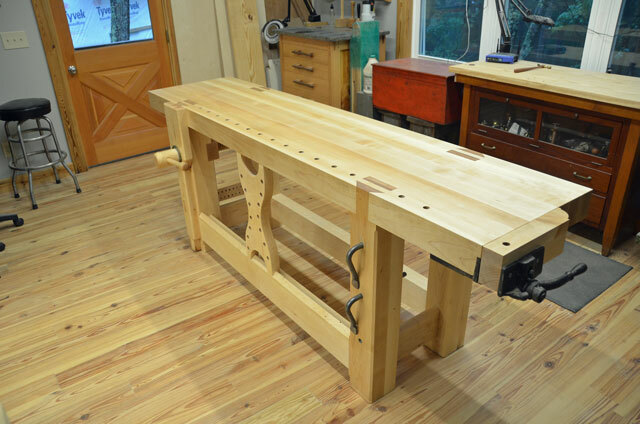 Our November 2013 Workbench of the Month features Lloyd P. from Mars Hill, North Carolina. 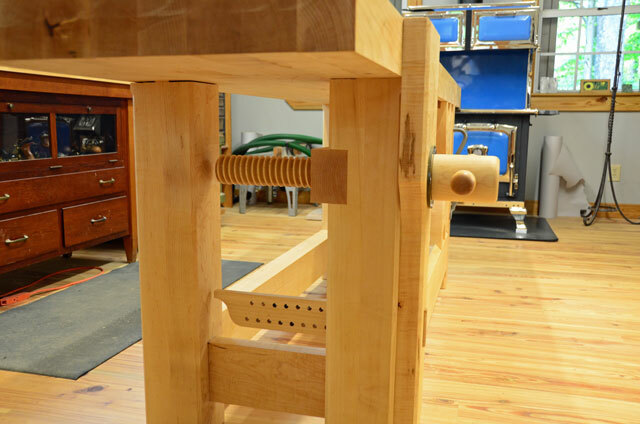 Lloyd has built a tremendous Roubo style workbench that we’re sure you’ll all appreciate. 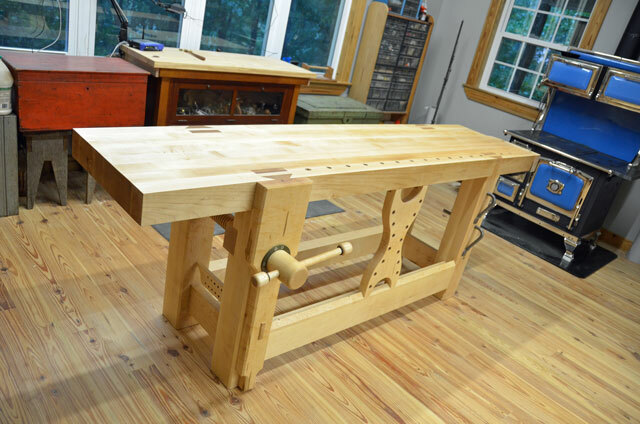 We are also now covering our Lake Erie Toolworks Workbench of the Month on our blog, which gives everyone the capability for interactive comments and feedback regarding the fine workbenches that are featured here. We hope that you both use and enjoy this new functionality. Just over a year ago I ordered a vise kit from Lake Erie Toolworks. The vise arrived well protected in its packaging and I opened it to find the vise screw and nut crafted to perfection. 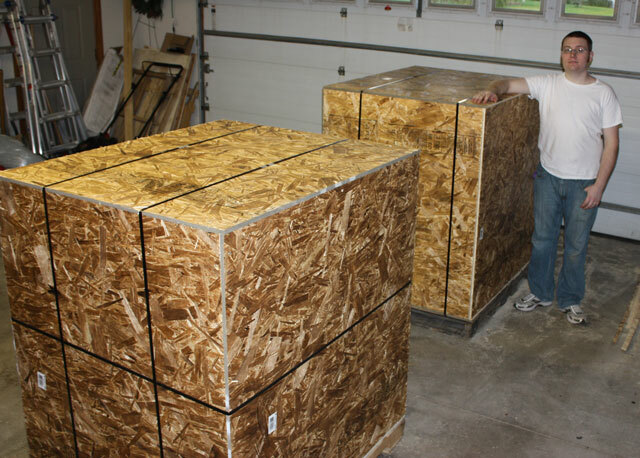 Unfortunately I didn’t get started on the workbench, so for the next 10 months I stepped over the hard maple I had purchased for the workbench “stored” on my shop floor and the vise went into protective custody in the attic. After allowing the maple lumber and vise screw to become well acclimated to the moisture of our Western North Carolina mountains, I finally got started on the workbench this spring. I think it was fear of cutting those large mortise and tenon joints of the Roubo style bench I was planning to build that caused me to delay getting started. Chris Schwarz’s Workbench Design Book was my guide to building the workbench. Completed bench measures 96″ long by 22″ wide and is 35″ high. Finish is Watco Danish oil, natural color. West System Epoxy was used to glue the legs into the bench top and the stretches into the leg mortises. The antique tail vise was purchased from the car trunk of a shopper at a yard sale that my wife and I were holding. I am very satisfied with the quality of the Lake Erie vise screw, nut and all other parts. Leg vise assembly was easy and with a bit of bee’s wax lubrication the vise moves in and out like butter.